Allmax Nutrition ZMA is a patented anabolic mineral formula. It contains Zinc Monomethionine Aspartate, Magnesium Aspartate and Vitamin B6. It is an all-natural product that has been clinically proven to increase anabolic hormone levels and muscle strength in athletes. 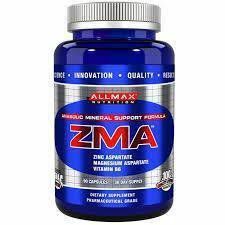 Any bodybuilder looking to gain strength, increase athletic performance, and muscle mass should consider taking ZMA.